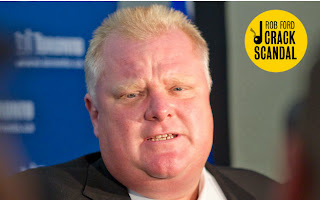 Toronto Mayor Rob Ford, who recently admitted that yes he really had smoked crack, after a long time of denials, was recently seen on video in a highly agitated state threatening to kill an unspecified person. Now I don't much care what people do in their personal lives but I don't think it's too much to ask that the mayor of your city refrain from ingesting illegal drugs and vividly demonstrating his intention to commit bloody mayhem. But apparently that's just me. Plenty of people seem to like him. In fact his approval ratings had gone up before his latest admissions and the revealing of the latest strange video. You do wonder what it would take for some people to question if Rob Ford is the right leader for the city of Toronto. In fact, as a Facebook friend pointed out, similar actions by former Mayor Marion Barry of Washington D.C. were used as prima facie evidence of Barry's utter unfitness for office, the stupidity of people who had voted him into office and as another good reason why the people in Washington D.C. did not deserve statehood. Hmm. What could be the difference between the two mayors? In any event here's to hoping that Mayor Ford finds the help he needs to stay away from mood altering substances, including carbohydrates. Because watching him throw his tantrum I was rather surprised he didn't have a coronary on the spot. Despite the controversy, Ford is clinging to office, confounding critics and delighting supporters who say he’s done plenty of good for the city — despite headlines around the world that have splashed a bit of mud on the image of the gleaming lakeside city that’s arguably the cultural center of English-speaking Canada.“He’s human. We all make mistakes,” one resident told Canadian broadcaster CBC Toronto. “If he smokes and saves me money, I’ll vote for him — even if he’s a bum,” said another. In fact, some polling data suggested Ford’s approval ratings had actually climbed in the days before his stunning announcement Tuesday after months of denials — as they had in September with the scandal in full swing.